We pretended that the upper school was a foreign country with generally pro-western leadership, but with a population where the United States was viewed less favorably than the country’s leadership viewed them. Maybe a modern-day Jordan, Bahrain, or Kazakhstan. Grades 7-11 played as civilians in this hypothetical country. We surmised that that country’s leadership, having credible information that a terror-cell operated within their borders, invited a CIA “action-team” into their country to prevent the attack and dismantle the terrorist network. This meant that the seniors had certain police powers at their disposal to arrest, detain, and send those they suspected off to Guantanamo. The “bad guys” had to do all of their communicating between 7:30-3:00 on school days only. Thus, all of their actions could hypothetically be observed by someone and reported to the seniors. We allowed for a “Third Party” option to develop as well, a grass-roots party that wanted to eliminate terrorist presence from their country, but didn’t want the CIA/America to get credit for it. This group would be more nationalistic, craving their own identity apart from both the U.S. and radical Moslem world. Try and win the local population over to their side and try and encourage them to adopt more western customs. In the days leading up to last week I discussed the game with the seniors. What I hoped they would realize was. . .
Finding the bad guys should not be their primary goal. If they spent time building up their relationships with the students, building trust, and rapport (as well as greasing the skids with appropriate gifts and bribes) the intelligence they needed would come to them from the other students. According to the rules of the game, mistakes the seniors make hurt them more than their successes help them. So, for example, if they falsely detain an innocent person this costs them more than when they get it right and detain a terrorist. This bears out true in real life as well. Our mistakes get magnified much more than our good deeds. We may lament this, but it is a fact of life. If the Yankees, for example, lose a playoff series, the story is not what the other team did well but what the Yankees did wrong. So — they would need to use their “police-power” judiciously. They could not “shoot their way out” of their difficulties. I thought this a very perceptive comment, and it illustrates perfectly much of our predicament abroad. Overcoming this requires a lot of careful effort and patience. We also have to realize that these anti-American/pro-independence movements may not necessarily be our enemy. We may not want to overcome it at all, but find a way to work with that attitude. The seniors soon found themselves opposed at least in part by the PLA, the “People’s Liberation Army.” This group ended up having a strong following among some high school boys, but they failed to extend their support beyond their original following. The terror cell also had their network dismantled, so they could not win either, even though their bomb attack went off as planned. In the end, the game finished as a Shakespearean tragedy — nobody won! My thanks to all the students who participated in some way and helped make the game a success. Tyler Cowen’s Marginal Revolution deserves all the praise his blog receives. Somehow in the space of a paragraph or two he manages to convey something of substance about a whole range of issues. His links are always interesting. 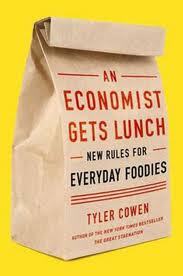 Those familiar with his blog know that he loves food, and his recent book, An Economist Gets Lunch has generated a lot praise, again deservedly so. The best barbecue is always in rural areas, but the best of all is in central Mexico, because of their tradition of pottery making. The best French dining experience is to be found in Japan, where the service will be much better, and the food cheaper, then in France. If nothing else, Japanese do brilliant copy work, so the recipes will be exactly what they would be in France. When dining expensively, order what seems least appetizing to you. It must be good, while the roast chicken probably is nothing special. If you are a real foodie yourself, don’t look for a restaurant where people are smiling, talking, etc. Look for a place where people are silent, serious about what they are eating. It’s a real bonus if you find people arguing with each other or the wait staff. It shows that they are regulars, comfortable with the place. By all means enter, you’ve hit the jackpot. Many more such tidbits exist, all of them intriguing in their own way, such as why you should look for Thai food inside of hotels, or why you should avoid dining establishments in strip malls that have a Target or Wall-Mart. Cowen also has some “serious” chapters on more substantive policy matters like agribusinesses and genetically modified foods. I found myself agreeing with him about these areas, but did not like them in this book. He shoots for too much, the styles don’t mix. To really convince us that agribusiness is actually better overall for the environment than “locally grown” (a proposition I’m certainly willing to entertain) he needs to cite more statistics, studies, and so on. But if he did this, it would alter the tone of the rest of the book. His section on why genetically modified foods not only pose no threat, but can benefit us greatly, persuades, but to really hit a home run he would need to do more. Though the text bogs down in these “heavier” parts, at least they serve as a good introduction to the issues. Cowen stays full of surprises throughout. For example, he advocates lower tax rates on corporations, which you would expect from a libertarian leaning economist. But, surprise, surprise, he also urges a “carbon-tax” on corporations as well. It’s twists and turns like this that will keep you reading An Economist Gets Lunch. More government usually means more standardization, and I agree with Toynbee that standardization presages decline, for it robs a society of flexibility and nimbleness of mind. More government can lead to a creeping “Can’t Someone Else Do It?” approach to life whereby we abdicate responsibility for our lives to others, hardly congenial to a democracy. I realize this very brief defense of a big idea hardly suffices, but I mention it only to say that someone who wants to be consistent on this position will find significant problems with both presidential candidates. Since its hardly sporting to lob grenades at an obvious opponent, I will instead focus on Romney and Ryan’s hearty support for “E-Verify,” a program that would create another massive government database, and give significant power to the government for determining who can and cannot work. The system also exposes too many legal workers to the risk of being falsely denied permission to work. As my Cato Institute colleague Jim Harper concluded in a study of the program, “It would deny a sizable percentage of law-abiding American citizens the ability to work legally. Deemed ineligible by a database, millions each year would go pleading to the Department of Homeland Security and the Social Security Administration for the right to work. Cato’s full study on the negative impact of Arizona’s immigration laws is here. As a further service we will be updating our records after the expected high turnout for the [election]. We will then send an updated vote history audit to you and your neighbors with the results. Articles on this monstrosity abound, one of them being here. The information age presents many temptations for those in the know, whether they be liberals or conservatives.